It can be hard to feel original in the blog world. Inspired by this delicious cauliflower salad I made a couple of weeks ago, I made this dukkah-roasted carrot and cauliflower salad. Then while scrolling through my Bloglovin feed later in the week, my recipe began to feel like a imitation of this recipe by The Healthy Chef and this recipe by My Kitchen Stories. However this is a salad full of great seasonal flavour, colour and textures and not to mention highly nutritious. I recommend you make something similar, regardless of which of the three recipes you use as inspiration! Dukkah originates from Egypt and is a spicy mix of seeds and nuts. I purchased mine from the Queen Vic Market but you can easily make your own, such as this recipe that uses hazelnuts, sesame seeds, cumin seeds and coriander seeds. Pomegranate molasses is thick and tangy and can be bought from speciality delis. And please leave the skin on the carrots to make sure you don’t miss out on all of that goodness. This would work really well served with quinoa to make it a more substantial meal and I added some spinach leaves when I ate it, just because a salad doesn’t feel quite right to me until it has green in it. 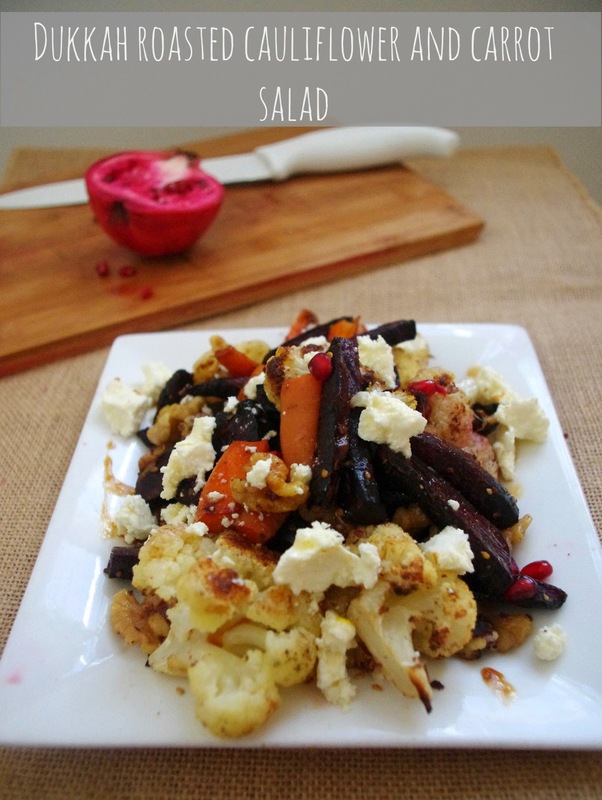 Dukkah-roasted cauliflower and carrot salad. Cut cauliflower into small florets and cut the carrots into small batons. Place the cauliflower and carrots on a baking tray and toss with the olive oil and dukkah. Roast in a moderate oven for 30 minutes or until vegetables are softened and browning. Place cooked vegetables in bowl and add pomegranate seeds, feta and walnuts. To make dressing, combine all ingredients in a jar and shake and pour over the salad. Serve with baby spinach and quinoa. Tell me, do you often feel like it has all been said and done on other blogs before you can add anything new to the conversation? Here via the Fab Foodie Friday link up. This looks so good, and is perfect with the purple carrots I bought the other day as well as cauliflower being so cheap and plentiful. Will definitely be making this as well as checking back for more ideas! Thanks, I've got a bit of a thing for cauliflower at the moment, it must be the season! Great idea! I'm always looking for new ways to eat cauliflower. I thought that purple carrot was beetroot there for a second! Thanks Tammi. Roasted beetroot could actually work quite nicely with these flavours! I love when you read a recipe and have all of the ingredients, it's a sure sign you should make it! Good luck with the Mamma mia comp!